Another clean-up of plastics along the coast will happen next Sunday 20 May. It is to work along the beaches of Cala Viola and Cala Roja, near Cavalleria. The plastics which arrive in an uncontrolled manner into the natural environment turn into a huge problem, especially the effects that are observed on the marine environment. The Menorcan people are reacting against this problem and are organizing collective initiatives to try to reduce the problem and spread awareness. On this occasion, the meeting point will be at 08.30 in the car park of Sinia des Cuc, so that people can share cars to go to the area. For those who do not come from Mahon, the meeting point will be at 9.15 in the car park to the Cavalleria beach. In the middle of the morning, there will be a picnic of products from the network of farms that are a part of the Land Stewardship scheme for all participants. It is expected that the event will finish at 13.30. It is open to all and we hope you will invite friends and family. It is suitable for adults and children. If you would like to join in this event, please would you give your name by phoning GOB on 971 350 762, or send an email to custodia@gobmenorca.com specifying the number of people that will accompany you. 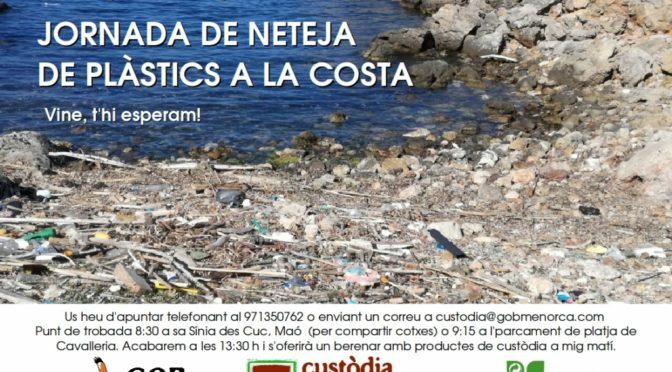 For tackling the problem of biodegradables GOB has organised a conference on the recycling economy for 31 May and more details will be sent. These activities take place with the help of Ecoembes.